June 28 - July 26, 2014. Specs: 10x10x12' constructed room inside the gallery. Walls covered with approximately 1,200 risograph-printed collages of digital collages of pen and ink on intaglio prints. 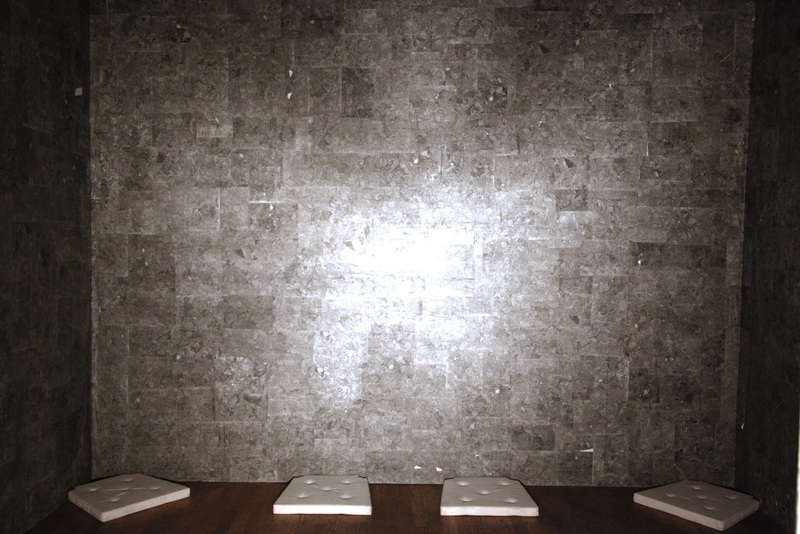 Walls prepared with transducers and homemade light-sensitive amplifiers. MP3 players. Handmade prepared LED flashlights. Magnifying glasses. Monoculars. “Culling inspiration from a diverse collection of sources, Jordan Knecht has created an installation that is, at once, both personal and universal. Dichotomy is an essential element to the artist’s work, from the exclusive use of black and white, to the process of its creation, which involves first, handmade mark making, then, mechanical reproduction. Even the soundscape which permeates the 10 foot x 10 foot x 12 foot high space, is an amalgamation of various sounds, including those created by the artist’s hand while carving the intaglio plates, as well as the machinery used to make the risograph copies. The visual components to Animum Explorari reinvigorate a dialogue with order/chaos, design/chance, explored in depth during the mid-sixties by San Francisco artist, Bruce Connor. In his Maze Drawings, Mandala Drawings, as well as Book, a collaborative effort with the poet Michael McClure, Connor created dense prints which expressed organic forces on both the microcosmic and macrocosmic level. Knecht has succeeded in reintroducing these antipodal concepts within an entirely experiential context. The images within the installation are accompanied by an explorer kit, including a beautifully produced, limited edition book of poems, titled Ignoring the Path, collected from the insights and experiences of the artist while producing the highly detailed prints over a period of four years. Visitors are encouraged to read and contemplate those thoughts while exploring within the dimly lit space, their only significant source of light being a handmade flashlight which requires the individual to pinch a set of wires in order to engage the battery’s circuit. Also included in the kit are a magnifying glass and a monocular for investigating the delicate subtleties of Knecht’s intricate prints. As visitors explore the installation they are surrounded by sounds generated during the process of the work’s creation. Various tracks of different lengths loop, ensuring infinitely unique combinations, and making it highly improbable for any exact repetition to occur. Knecht’s inclusion of chance stems from his interest in the creative work of artistic pioneer, John Cage. Cage often explored the concept of chance through his work utilizing the I Ching, the Chinese Book of Changes, and a process of divination through varying combinations of 64 hexagrams which express different aspects of the two elemental Taoist forces of construction and destruction, yin and yang.